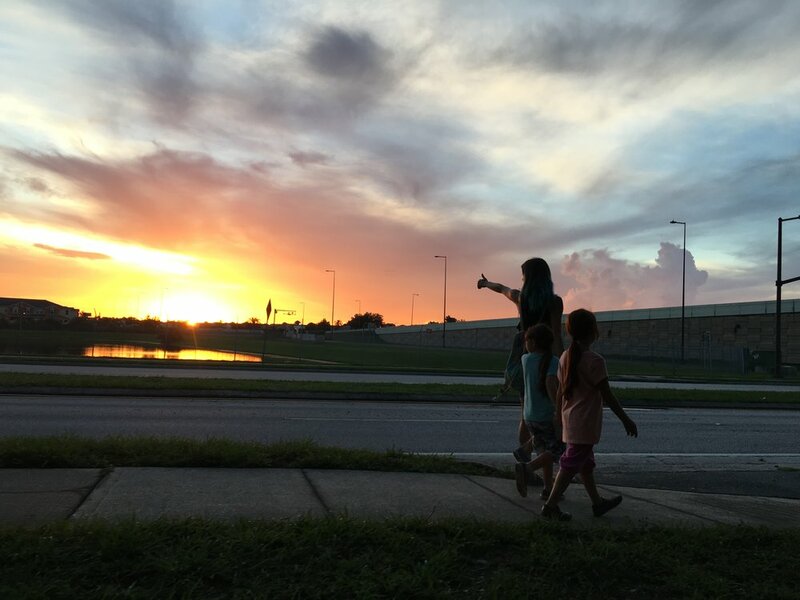 The Florida Project covers part of a summer in the life of the denizens of motels along US 192, a stretch of highway right around the entrance to one of Walt Disney’s places. It is a world whose architectural style feels like a distorted echo of Mickey’s magical wonderland, a style that is outlandish and bright, featuring the kind of muscular eruptions of shape and color that define the American psychedelic Ken Kesey and his Merry Pranksters used to trip out to to. Sean Baker photographs this world in a way that feels in tune with the riot of colors and shapes populating this skyline, made up by these buildings and the forest of signs, lights, and traffic signals grown thick around such the road. The government insists on beautifying this stretch of highway by tearing such structures down (replacing them with cookie cutter retail outlets per Google Street View). “We were actually losing locations,” said Baker during our interview (he and co-writer Chris Bergoch have been working on this film since 2011). The eye-popping vistas that Baker carves out of this landscape makes me feel like his idea of beauty is a lot more interesting than the government’s. The sun sets brilliantly over the One Nine Two. Baker and Bergoch have created a rich tapestry about the community in these motels, though “motel” is a loose term. Most of them actually live in these places, even though every now and then they have to spend the night somewhere else because people can’t like technically live in motels according to America’s (often insane) patchwork of rules that make life unnecessarily hard for people who don’t have enough money to ignore them. Two of the most colorful threads in this tapestry belong to Moonee, played with profound aplomb by Brooklynn Prince, a spirited young girl who creates camaraderie wherever she goes, and her mom, Halley, played vividly by Bria Vinaite, (both newcomers) who live in a motel called The Magic Castle. Moonee brims with life and imagination, creating ways of passing the time for her and her coterie, some of which are more, uh, destructive than others. Our first adventure with Moonee after the outrageously vibrant titles play out on a purple wall to the ironic strains of “Celebrate!” includes Moonee and the gang screaming obscenities at a car owner, whose ride they have just had a good old time spitting on. Moonee’s behavior soon becomes contextualized when we meet her profane and forward mom. Right from the first scene, we can feel Baker’s compassion and nerve. The Florida Project captures colorful people, with rough, rough edges in a compassionate way that is vital and authentic. Moonee and her friends, Scooty and Jancey (who the group picks up after Jancey’s guardian forces Moonee and co to clean the windshield of that car they just expectorated onto) exist in a precarious world, not that they are aware of that. Much of Moonee’s day involves waiting for scraps from the restaurant where Halley’s friend Ashley works (Mela Murder, another charismatic newcomer who shines in this film) or traipsing down 192 to beg and cajole for ice cream or just finding some action around the Castle, often to the annoyance of the good natured motel manager, Bobby (Willem Dafoe doing some of his finest work ever - hold that thought), who is busy all day with more than just the consequences of the boisterous energy of the children. Baker presents all of this activity with stunning fluidity, which you would expect from the filmmaker behind the kinetic Tangerine. The switch to 35mm lets Baker scale up and in, which he uses to great effect to carve out moments of contemplative grace, both by stepping back to drink in the broader landscape and by pushing in to focus on heads and faces. Baker reeled off the list of the very practical reasons the script he and Bergoch created had to provide a strong spine during shooting to me: the short time allowed to work with child actors, the hot summer sun in Florida, 35mm. But within the highly structured spine of the script/shooting schedule, Baker creates spaces for his collaborators to own their roles. Sometimes the contributions are small (but impactful! ), like Brooklynn’s ad lib at the end of a conversation the kids have over a melting ice cream cone. “The melting ice cream scene is word for word except for . . .” Baker tossed it over to Brooklynn during our conversation: “You’re not welcome!” Baker smiled, “No one expected that.” Other scenes demanded almost total improvisation, like the many scenes of Halley (sometimes with Moonee) selling perfume in front of golf clubs and nicer resorts. These were filmed “Candid Camera” style; prospective customers had no idea they were on camera until they were being chased down to sign releases. Vinaite described the situation of trying to sell perfume to strangers as a bit surreal and almost mortifying, it was so outside herself. She was still disappointed that the only people who bought anything were the ringers they sent in when Halley had to succeed. Some of the sweetest and freshest moments in the film come from improvisatory spaces. There are repeated scenelets of Moonee taking a bath (something that takes on a darker meaning later in the film), which are just pure wonderful. “He handed me these mermaids and said ‘Wash ‘em’ . . . Ok.” Brooklynn is an embodiment of being up for anything. It’s something Baker noticed right away. When she was paired with Christopher Rivera (Scooty in the film), he started doing push-ups to psych himself up for the audition. Brooklynn joined in the exercise by doing squats, a form she learned watching her father. “Christopher started doing push-ups and I was like . . . ‘Mmm. Ok’” said Brooklynn. Her vibrance and zest for life sing out throughout her performance, never more so than during a bittersweet montage of Moonee devouring nearly every possible type of food at a buffet in a local resort where Halley takes her ahead of a rough time Moonee doesn’t know is coming. Baker parks the camera in front of Brooklynn and just drinks in her many inspired ways to dispatch the huge array of food on her plate. “I’m an eating fiend,” explained Brooklynn, and gestured toward her dress, a Lisa Frank inspired fantasia on ice cream cones and neon, a good dress for a hot day in DC. Baker deliberately avoids the usual Hollywood casting pool and process. “Think of every 24 year old A-lister, that’s who they wanted to cast” as Halley. Baker discovered Vinaite on Instagram: someone reposted one of her videos at just the right time. “Whoever reposted that, they deserve a bouquet or something,” Vinaite joked. There is no questioning her energy and the freshness of her performance (or her evidently affectionate connection with Brooklynn). Casting is central to Baker. “I lay awake at night if there is a weak link in the cast.” In a cast full of feature film debuts, children, and acquaintances (ok, Macon Blair isn’t exactly any old acquaintance, but still), Baker asserted “there are no weak links in this cast.” The clearest evidence of that is Dafoe’s performance. Dafoe an acting heavyweight with plenty of scenery chewing on his resume, but it never feels like he is in a different movie. Dafoe’s work is of a piece with Brooklynn’s and Bria’s and the rest of this marvelous cast. It’s impossible for me not to agree with Baker wholeheartedly. The Florida Project is a clear eyed, incisive, and compassionate look at life in a marginalized community, where many lives teeter on the brink of oblivion (and some fall). Baker and company don’t sentimentalize or gawk at this community; the film doesn’t feel like privileged outsiders directing the traffic of our attention around. There is a rootedness and authenticity to the world they create and the stories they tell. The children’s romp through some abandoned condos felt like it had been ripped from the memories of my own youth, when I made construction sites my playground years and years ago. The Florida Project is vital and beautiful without losing sight of the roughness of these stories, it is tragic without being treacly. If anything the film simmers with anger and frustration; perhaps from the consciousness of how the wealth, opulence, and privilege down the road hovers over these hard scrabble lives, exerting pressure on them, pushing them out of this part of paradise. The Florida Project is a rich character study of people in a surreal landscape, that strives to capture a precarious community where poverty’s burdens are heavy but which pulses with life and beauty nevertheless. I am grateful to A24 and PR Collaborative for arranging an opportunity to interview Sean Baker, Bria Vinaite, and Brooklynn Prince, busy people who were gracious enough to share some of their time with me. Instagram should probably be billed as a co-star in Ingrid Goes West. Instagram’s rhythms; tap tap, CLICK, an empty heart goes lovely pinkish red; it’s mannerisms, and aesthetic, #perfect are the core of this sharp film from Matt Spicer, who directed and co-wrote the script with David Branson Smith. Characters read their posts aloud, usernames and hashtags included, a stylistic affect that is used just enough to be useful and incisive, but not so often as to be a crutch. It’s certainly appropriate for a film dedicated to exploring the toxic brew of obsession, addiction, image, hope, and despair burbling just beneath the glossy vision of life so often found on Instagram. Ingrid Goes West begins with a brutal act of pre-meditated violence that lands Ingrid (Aubrey Plaza) in a mental institution, a horrible act that grew out of an irrational attachment to someone because of a casual Instagram interaction. For a good bit of the prologue of this film, it is just us, Ingrid, and her phone. Aubrey Plaza sells the drudgery of Ingrid’s gray existence, both in the institution and in the home she used to inhabit with her mother who has recently died after a long illness (the detritus of home care is strewn all over her abode), very well. It is not hard to understand why Ingrid chases the Insta-life of Taylor Sloane (Elizabeth Olsen), her latest obsession, when she is presented with a cashier’s check for the settlement of her mother’s estate. With $60,000 in a backpack and absolutely no thought for the future, Ingrid goes to LA to find Taylor’s beautiful breakfast spot and to create a life for herself that so resembles the idea that Taylor is creating on her Insta feed that Taylor will have to accept Ingrid as her friend. After that, who knows? Certainly not Ingrid. Ingrid is awkward and socially graceless but she has a burning, intense sincerity that charms the pants off people. Whenever that is not enough, she also has the ultimate social lubricant: cash. Ingrid lands a home base in LA when she stumbles on an apartment being rented by a Batman-obsessed stoner named Dan (Straight Outta Compton’s O’Shea Pinter) who instantly crushes on Ingrid. Before long, Ingrid succeeds at ingratiating herself with Taylor through the kind of dirty trick that would prominently feature in a Ben Stiller movie - the awkwardness quotient of Ingrid Goes West generally lands in the same “squirm-inducing” zone of Stiller’s best work. Cash and obsession assisted, Ingrid does her best to have the same experiences and read the same books and like the same things as Taylor. She is rewarded with an inside view of a couple, Taylor and artist husband Ezra (Wyatt O’Keefe) that should be a cautionary tale. Taylor’s job is to be a brand ambassador on Instagram; she is, essentially, a living billboard, a tableau vivant of capitalism. Ingrid is largely oblivious, though, to the tension this brings to Taylor’s relationship with Ezra, who doesn’t even have a smart phone, though we see it very, very clearly.. Matt Spicer and David Branson Smith do a great job exploring the relationship tensions between Ezra and Taylor and the sharp edge that every day life mediated by the irreality of the social graph gives to all relationships IRL. The film excels at exposing the #firstworldwhitepeople emptiness of Taylor and Ezra’s existence, even as such hints of the howling void inside their lives fly right past Ingrid. Aubrey Plaza continues to be amazing at playing intense and awkward, her Ingrid means so so so well even as she engages in skulduggery to keep her fantasy world alive. Elizabeth Olsen, who has undoubtedly lived the exact kind of disjoint between the reality of life vs life as presented to /created by consumers that Ingrid Goes West so precisely skewers, is also excellent and subtle, allowing us glimpses of Taylor’s abject fear as Ingrid’s sincerity exposes just how much of her Insta-life is a facade. O’Shea Pinter is really fun as the comic nerd stoner landlord, even if Dan and Ingrid have a bizarre chemistry that feels like it comes from a different movie entirely, a rom-com about weirdos forced together who find things they need in each other despite it all (a movie I would totes watch, btdubs). The magic life inside the tableau proves to be a short-lived experience for Ingrid, not just because Ingrid’s backpack isn’t big enough to contain enough cash to keep living dat branded life. While Ingrid moves relentlessly forward, aided immensely by her possession of cash money and a clear set of signposts being thrown off by Taylor’s Instagram feed her own growing popularity, like an Insta-Wile E. Coyote spinning his legs over the void, magically avoiding a fall to the distant ground below, but only as long as they aren’t aware of the danger. Ingrid becomes aware of the void when she meets Taylor’s obnoxious brother, Nicky (a ripped Billy Magnussen), a Tasmanian-devil of coked up bro-dom who instantly suspects Ingrid of being up to no good, scammer recognizing scammer, game recognizing game. The final act of Ingrid Goes West doesn’t quite integrate the successful critique of Instagram poseurdom of the rest of the film thanks to an over reliance on plot machinations involving blackmail plots and counterplots, revelation, and an unwelcome return of focus to Ingrid’s (supposed) lack of mental stability to bring her crashing down. Most of the film is a high wire act where Ingrid, while she has enough cash to keep it going, mostly succeeds in making herself into a completely different person than the one we met, trapped in grief and institutional hell, as the lines between being someone and pretending to be one bleed until the performance of an assumed identity starts to become undistinguishable from authenticity. Ingrid, by now friendless, cashless, and utterly alone recognizes that her obsessive drive to re-invent herself makes her exactly like Taylor and Ezra, they are just less desperate and more fortunate than Ingrid in where they started, but those ships have sailed and been burned on the beaches of the New World by the time she can articulate that and all she is left with is a much more radical act, performed in full view of the world on Instagram, which is exactly as it should be. Ingrid Goes West is ultimately a rewarding sit, thanks to its incisiveness about Insta-culture and some really charming performances, even if the frame of mental illness is ultimately unhelpful. Spicer’s movie explores the darkness in human beings’ insatiable desire to belong and be seen, a desire that can be pushed well beyond what is healthy, and not just by people like Ingrid. Despite the third act missteps, Ingrid Goes West ends in a space whose bleakness stems from its banality. Ingrid’s pursuit of a place in the Insta-celebrity world draws our attention to how the desire for engagement and the need to live up to an image that someone else provides can be so caustic but thrilling, a vicious, addictive cycle that might not be very good for us . . . not that we can figure out how to stop it.